SynForce™ Green is an extreme heavy-duty, multi-purpose, aluminum complex base grease engineered with severely hydrotreated polyalphaolefin (PAO) synthetic base fluids, and high viscosity index paraffin base oils. Our most advanced extreme pressure grease, SynForce™ Green is designed to withstand the demands of extreme and intense working environments. With exceptional four-ball wear test performance, SynForce™ Green shields metal surfaces from wear during periods of tremendous pressure, increased heat and high shock loads. As conditions intensify, this grease delivers exceptional mechanical and shear stability performance and water washout resistance. 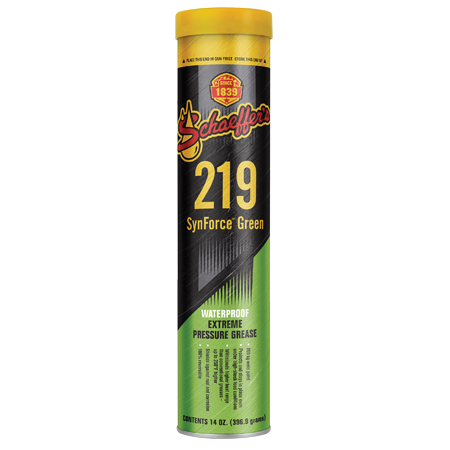 Fortified with synthesized moly for an extra layer of protection, SynForce™ Green significantly reduces friction, which reduces wear and contact area temperature. This results in increased equipment life, less downtime and extended lubrication cycles. Made with next generation Schaeffer technology, SynForce™ Green outperforms calcium sulfonate and calcium sulfonate complex base greases. Excellent extreme pressure and load carrying capabilities (Four Ball E.P. Weld Point >800 kgs). Excellent protection to shock loading that protects and cushions against impact, vibration, stress and chatter during heavy loads and start-stop operations. 100% reversibility—grease retains its grease-like consistency and remains with bearing during severe mechanical action. Strong resistance to oxidation and thermal degradation especially during high temperature operation.